Arizona forward Aaron Gordon look to pass while being pressured by Southern forward Damien Goodwin during the first half Thursday at McKale Center. The signs were there for a letdown. Arizona was coming off arguably its biggest win of the season. 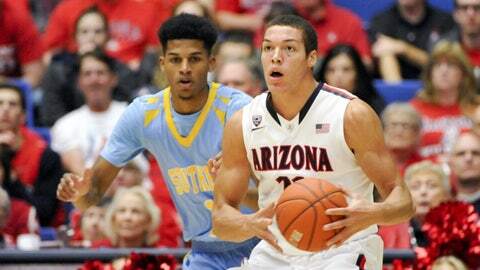 The Wildcats were playing without 7-foot center Kaleb Tarczewski and were in the midst of finals for their coursework. It wasn’t always pretty, but they shook off the distractions and pulled away for another victory. 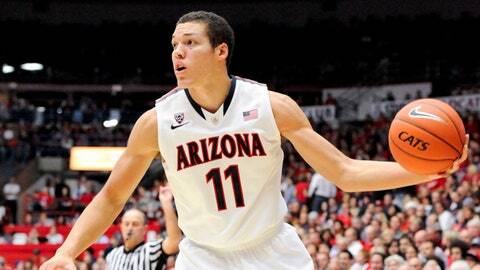 Aaron Gordon scored 21 points, Nick Johnson added 17 and Arizona opened its second week at No. 1 with a 69-43 rout of Southern on Thursday night. "I’m happy for the win from the perspective of this was a hard week for our team," Arizona coach Sean Miller said. Coming off a comeback road win over Michigan on Saturday, Arizona (12-0) raced out to a 15-point first-half lead despite having to shift players to new positions with Tarczewski out. The second half wasn’t quite as smooth, and the Wildcats went 22 of 37 on free throws, but they turned it over just eight times and played well at the defensive end to start 12-0 in nonconference action for the second straight season. Brandon Ashley had 11 points and 10 rebounds for Arizona, which outscored Southern 34-12 in the paint despite Tarczewski’s absence. "Overall, we’re headed in the right direction," Johnson said. "Kaleb is a big body down low that takes up a lot of space in terms of rebounding and limiting second shots. He’s really our rim protector." Southern (3-8) had played tough road games against Marquette and Florida and fought back against the nation’s No. 1 team after a miserable first half. The Jaguars weren’t able to dig out of that big hole, going 5 for 21 from 3-point range and 4 of 15 on free throws. Malcolm Miller and Calvin Godfrey had 11 points apiece for Southern. "Playing under the pressure of coming to a No. 1-ranked university and against athletes like Arizona has will hopefully help us in our conference," Southern coach Roman Banks said. "We won’t see that much talent, so I think it will make us better scorers and help us be more efficient offensively." Arizona moved to the top of The Associated Press poll last week for the first time since 2003 and immediately faced two difficult tests. The Wildcats passed both, racing past New Mexico State after stumbling early against the Aggies’ quirky defenses, then rallying from an 11-point deficit to beat Michigan for what may be their biggest win of an already impressive season. Arizona’s task over its next two games — the Wildcats face Northern Arizona on Monday — was to avoid complacency and looking ahead to the holiday break and the Pac-12 season. Southern didn’t figure to pose much of a threat to the long, athletic Wildcats. The Jaguars nearly pulled off a monumental upset in the first round of last year’s NCAA tournament, leading No. 1 Gonzaga late before losing to the Zags. Southern is a much different team this year after losing four seniors and with Godfrey ailing because of an elbow injury. It went about as expected early. Even without Tarczewski, who sprained his ankle against Michigan on Saturday, Arizona dominated Southern from the start, building a 12-point by the midpoint of the first half. The Wildcats kept rolling behind the wheeling and dealing of T.J. McConnell (five assists) and inside game of Gordon, who had eight of his 10 first-half points on layups or dunks. Southern tried to work inside-out on offense, without much luck; Arizona had an 18-2 advantage in the paint in the first half. The Jaguars couldn’t seem to hit much from anywhere, shooting 7 of 24, including 3 of 11 from the 3-point arc, in the opening 20 minutes. The Wildcats, on the other hand, had little trouble scoring, hitting 13 of 24 shots from the floor. Had they been a little better without pressure — 6 of 16 on free throws — the lead would have been even more than 34-19 at halftime. "They did what they were best at and accomplished a lot in the first half," Godfrey said. Southern was better offensively to open the second half and chipped the lead down to 10. But the Jaguars had no answer for Gordon. The freshman phenom used his long arms to reach over defenders for offensive rebounds and his strength to bull past them for putbacks. Gordon added a 3-pointer from the wing and hit three straight free throws after going 0 for 4 in the first half, drawing cheers from the home fans. "It’s hilarious, pretty much a realization that I’m not making free throws," said Gordon, who made 85 of 100 free throws during the team shootaround. "It made me laugh, we have great fans who are very supportive of me and it made me shoot a little better." That turned out to be the only excitement in the second half, as Arizona prevented Southern from getting any closer.